Our range of products include power tool gear. We are the prominent and leading manufacturer and supplier of Power Tool Gear. The offered power tool gears are designed by using premium quality material and advanced tools in accordance with set market norms. These power tool gears are properly examined on various stages by trained quality controllers for assuring its flawlessness from our side. 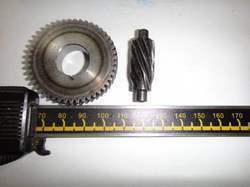 Customers can take these power tool gears from us at their budgetary constraints.